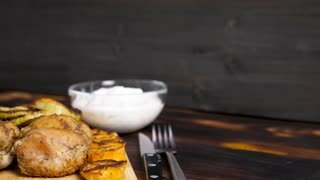 Search Results for "sweet potatoes"
Pan of white porcelain bowl full of cooked sweet potatoes, on wooden kitchen table, with woman typing on laptop blurred in the background. One whole purple sweet potatoes rotating on the turntable. Isolated on the white background. Close-up. Macro. Two whole and one half purple sweet potatoes rotating on the turntable. Isolated on the white background. Close-up. Macro. 1960s: Meat on platter. Woman spoons mashed sweet potatoes on top of pineapple slices on top of pork. 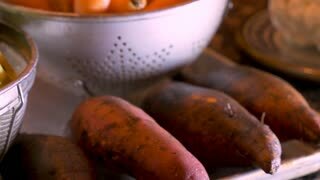 Pile sweet potatoes rotating, slow motion footage video. Young and beautiful woman in supermarket buying fresh and healthy sweet potatoes and vegetables for family. Arm choosing the tasty sweet potatos. Shopping mall concept for vegeterian. Sauteeing sweet potatoes on oil. The shot is in close up. 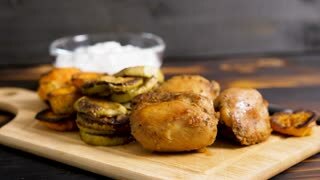 A medium shot of a healthy sauce mixed with sweet potatoes. A medium moving shot of a man cooking sweet potatoes.